National Catholic Schools Week concludes today having celebrated, under the theme “Catholic Schools Raise the Standards,” the many positives that Catholic education provides millions of students. In many areas of education parochial schools lead, but it is past due for Catholic education to confront its poor record on LGBT issues. Catholic schools, historically, strove to live according to the ideals of dignity and welcome by educating those of varying ethnicities, creeds, and economic classes with an emphasis on marginalized communities. Quality education in a respectful atmosphere, provided to all regardless of finances, was one fruit from generations of women and men religious, and now lay educators. Yet, the news today about Catholic education too frequently tells of unjustified firings for inclusively-minded church workers, a lack of support for LGBT students, or excluded same-gender parents. If Catholic schools claim they raise the standards, it is time to do just that by forging a positive future for every student, teacher, staff, administrator, and parent. On Wednesday of this week, I attended a discussion sponsored by Georgetown University about “LGBTQ Life on a Jesuit Campus.” Students, staff, Jesuits, and alumni gathered to reflect on Georgetown’s efforts to foster a welcoming campus for every student. These efforts blossomed in recent years to indeed raise the standards of LGBT acceptance there, and include the active LGBTQ Resource Center, an LGBTQ prayer group out of the Catholic chaplaincy, student organizations, and peer discussion groups. Not every Catholic institution of higher education, high school, or elementary school will be so progressive, lacking both the resources and prestige Georgetown benefits from. All can apply the lessons of Georgetown to their local circumstances though. Transforming a school into an LGBT-positive environment does not involve diminishing the Catholic identity, rather it involves enhancing those core principles of love, inclusion, and dignity that makes a school most Catholic. For younger students, creating respectful environments encourages life-long toleration for each person based upon their dignity, not their differences. For older students, schools can foster a harmony between developing spiritualities and sexualities and combat the harmful divergence of these two that leads to so much pain for students of faith. Catholic schools promise value-added education of the whole person, not just academic knowledge. Each of us must now contribute to creating an LGBT-affirmative educational system within the Catholic Church that truly raises the standards. The handicap of an institutional hierarchy fixated on anti-marriage equality efforts should not constrict parents, educators, and students from implementing small, meaningful changes at their institution. We can emphasize inclusive language that combats hetero-normativity and respects a variety of gender expressions and identities. We can create respectful classrooms where anti-gay name-calling and harassment are not tolerated, and actively programmed for eradication. We can explicitly include LGBT community members by welcoming same-gender parents and standing by transgender teachers. We can ensure schools provide counseling, spiritual, and guidance resources for students confronting the complexities of sexuality, spirituality, or some combination of the two. I recommended the website of the Gay, Lesbian, and Straight Education Network for further resources on making a primary or secondary school more welcoming. I also highly encourage those struggling within a Catholic college or university to contact New Ways Ministry for support we provide in Catholic higher education. We can do more to raise the standard of Catholic schools on LGBT issues and we must. The Gospel demands no less of us. 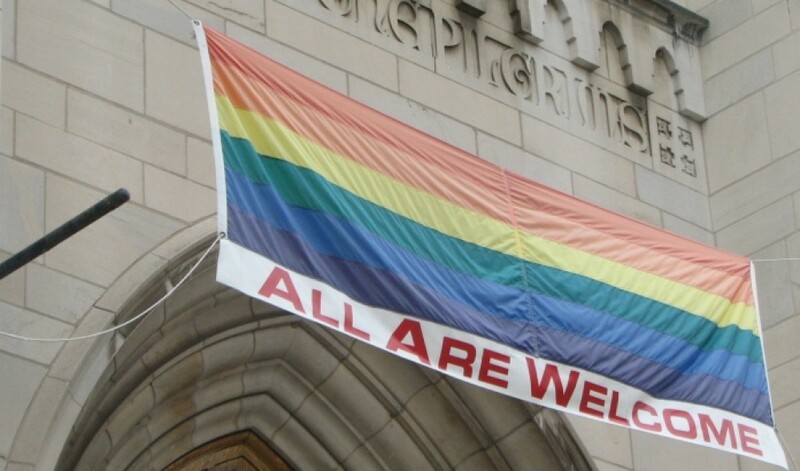 This entry was posted in Catholic Church and tagged Catholic Church, Equality / Inclusion, LGBT, New Ways Ministry by Terence. Bookmark the permalink.